The Pacific Scaup is native to North America, breeding in the Northern Tundra regions and wintering along much of coastal North America on both the east and west coast. The Pacific Greater Scaup is virtually identical to the nominate race Aythya m. marila that breeds in Iceland and the tundra regions from Scandinavia in the west to Siberia in the east with wintering grounds in coastal areas of southern Europe, Japan and China. The Pacific Scaup is a striking bird, that has a very round appearance on the water, the breeding plumage is very smart and the male has good iridescence in the head plumage that contrasts strikingly with a blue bill and bright yellow eye. The yellow eye is particularly distinctive when the male is displaying, having the ability to reduce the size of the pupil thus making the yellow eye appear larger and brighter. Pacific Scaup are easy to maintain in captivity and mix well with most species and they have no specific dietary requirements. In the wild they would obtain most of their food by diving and consequently they appreciate a deeper pond in captivity and will happily dive down to feed on wheat. While a deep pond is not essential it is certainly enjoyed and the Scaup can certainly be relied upon to eat any wheat that would otherwise be lost to a collection of dabblers. This also helps preserve the quality of the water if the feed is consumed rather than decaying at the bottom of the pond. Pacifc Scaup are virtually unknown to aviculture in Europe with most collections maintaining the nominate race or European Scaup. The Scaup that I maintain are direct descendents of Pacific Scaup hatched from eggs I collected in Hooper Bay, Alaska bask in 1991 when it was still possible to obtain licenses to collect eggs for hatching in captivity. 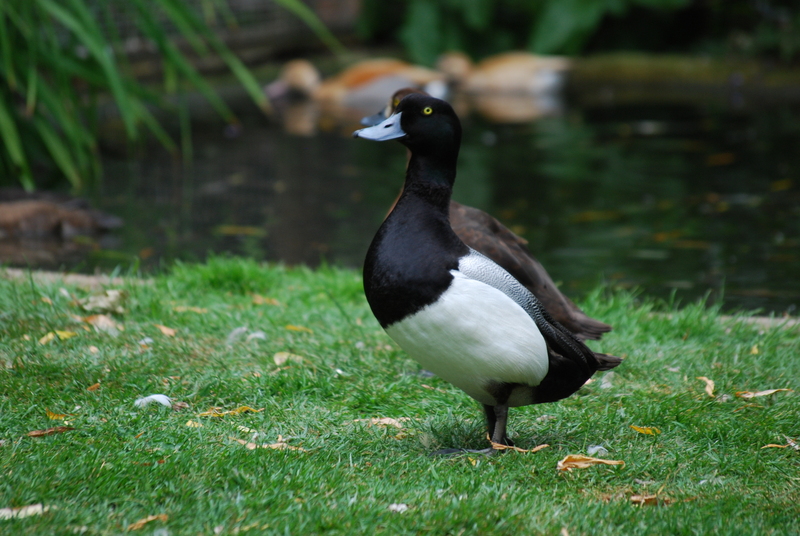 If maintained on larger natural ponds Scaup will breed readily but they are a little more challenging to encourage to breed on smaller artificial ponds. They always chose natural sites that can be some distance from water but they certainly have a preference for nesting in dense cover in damp situations that are more often to be found near the pond edge. The nest is usually well built from surrounding vegetation and can be quite significant if the vegetation is readily available for the female to keep adding to the nest. The large oval eggs are olive brown and a clutch can consist of between seven and ten eggs that take about 27 days to incubate. Incubation may be best left to the duck, during artificial incubation I find a much higher than normal incidence of the eggs addling at virtually all stages of incubation. Once the eggs are hatched the sooty dark brown ducklings are relatively straight forward to rea on a waterfowl or chick crumb diet. Male Pacific Scaup, descendant from young reared following an expedition to Whooper Bay, Alaska in 1991.